This morning Mr Condon began a sixth day of cross-examining Mr O’Connell. The witness agreed that it was a criminal offence to destroy documents relevant to an investigation. He said when he told Mr Drennan about his actions he did so knowing it could have led to very serious outcomes such as criminal investigations or disciplinary proceedings. He agreed with counsel that none of these things happened. He said that at the start of the current trial last October the Director of Public Prosecutions (DPP) offered Mr O’Connell what counsel described as “effective immunity” from prosecution. This offer came while Mr O’Connell was giving evidence during legal argument and he indicated to the court that he may wish to rely on the privilege against self incrimination. On October 12 last, 2016 the Chief Prosecution Solicitor for the DPP wrote to solicitors for Mr O’Connell stating that no evidence given by him concerning the destruction of documents would be used in evidence in any criminal proceedings against him. Mr Condon moved on to ask Mr O’Connell about the process of agreeing the statement of Kieran Kelly, the second witness from Anglo’s auditors EY (formerly Ernst & Young). The defence have told the trial that statements from witnesses from the auditors were produced as a result of coaching and cross-contamination between witnesses and that Judge Aylmer previously ruled that this was an unlawful process. The process of drafting Mr Kelly’s statement began in early 2011 with Liam Kennedy, a partner with A&L Goodbody (ALG), who represented EY, sending a first draft of Mr Kelly’s statement to the ODCE. The jury saw notes made over the following months. One note shows Mr Kennedy discussing the grafting of paragraphs and “cut and paste”. In June 2011 Mr O’Connell discussed meeting with the lawyer in the absence of Mr Kelly. He proposed this in an email sent to gardai seconded to the ODCE and to the then director, Paul Appleby. In the email he said the lawyers were the people who we had to convince about how best to move forward. “Even if Mr Kelly was in attendance it’s likely to be the lawyers who would take the lead role in discussing the next steps,” he continued. Mr Condon said that in the meeting that followed, there were four lawyers, two gardai and no witness present. The jury heard that the process of putting the statement together continued throughout the summer of 2011. In November 2011 Mr O’Connell said that “the statement was largely based on Vincent Bergin’s statement, which they had been happy with”. Mr Bergin is the other prosecution witness from EY and his statement was also produced as a result of the unlawful drafting practice. A draft of Mr Kelly’s statement provided from ALG to the ODCE in November 2011 contained multiple paragraphs labelled with a margin note “verbatim from VB statement”. The jury saw notes of advice given by Mr Kennedy to Mr Kelly in advance of a meeting with Mr O’Connell. Mr Kennedy is recorded as telling Mr Kelly that he may be asked to look at documents by the ODCE investigator. He advised Mr Kelly: “Be seen to look at a few. Say you have to think on it and reflect on it”. A later note states that Mr Kennedy told Mr Kelly “the less you say the better”. Mr Condon submitted that the legal advice amounted to telling Mr Kelly to “engage in a sort of pantomime performance” with the ODCE investigator. He said that in the subsequent meeting between Mr O’Connell, Mr Kelly and Mr Kennedy, Mr Kelly said very little and “sat there like a statue and didn’t open his mouth”. Mr O’Connell agreed that the notes of the meeting attributed very little to the auditor. Most of the notes show the investigator and the lawyer discussing the statement. Mr Condon suggested to Mr O’Connell that he had become too close to the solicitors for EY. Mr O’Connell said there was a degree of role playing where the two parties would be cordial with each other despite earlier “ups and downs”. 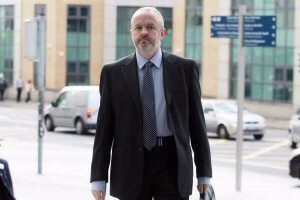 Counsel said that Mr Kennedy had taken on a role of intermediary between a State investigator and his own client. He said in one interaction in early 2011 the two of them agreed on what Mr Kennedy would say to Mr Kelly. He said this was redolent of an investigator who was too close to solicitors for a witness. “It begs the question as to whether he should have ever signed up to such a thing. His duty was to his client,” he said. Mr Condon noted that in October that year an initial report from the accounting regulatory body CARB included a number of negative findings against EY. An appendix attached to the report included a 153 page defence by EY concerning its audit.